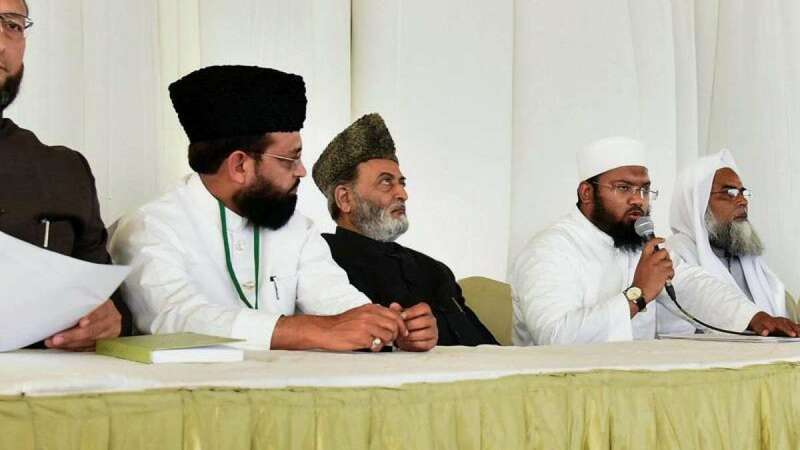 Hyderabad : The All India Muslim Personal Law Board, the apex body of Indian Muslims, on Sunday accused the present government of making attempts to break its unity. The AIMPLB at its 26th plenary, which concluded here on Sunday, said the government and some individuals with vested interests were trying to breaking the unity of the board. "The Board is fully aware of the attempts of the present-day government and some individuals with their vested interests to break this unity to the detriment of the entire community. It shall be our endeavour not to allow these unscrupulous deeds of some vested interests to destroy this unity," said the Hyderabad Declaration passed by the three-day meet. The declaration did not name anybody but the remarks assumed significance in the wake of executive member of the board Maulana Salman Hussaini Nadvi openly defying the board. Nadvi, on the eve of the plenary, mooted a formula that the land of demolished Babri Masjid in Ayodhya should be given for construction of Ram temple. He went against the board's stand that the mosque land can never be sold, gifted or exchanged. The plenary on the first day pulled up the cleric and decided to take action against him. The next day, Nadvi said he would not remain in the board. The board on Sunday unanimously decided to accept Nadvi's "disassociation". At a massive public meeting organised by the board on Sunday night, the board leaders underlined the need for maintaining unity and targeted Nadvi without naming him. The board in its declaration noted that it is a united platform of all the Muslims created for the protection of Shariah laws and to bring unity among the Muslims. "Unity among the Muslims is the best shield which should be protected at all costs," it said. They said that need of the hour for the Muslims to close ranks and to have utmost confidence in the board. "All the unanimous decisions of the Board should be graciously accepted with open heart and each one of the Muslims should be ready for greater sacrifice for our endeavour," it added. The board alleged that deliberate attempts are being made to sow the seeds of dissension and discord among Muslims by bringing to the fore such problems and issues which can create rift among various sections of the society and schools of thoughts. It also called for removing misconceptions and misunderstanding about Islam and for explaining that Shariah laws are for welfare of the mankind.